The Short-finned Pilot Whale (Globicephala melaena) is one of the two species of cetacean in the genus Globicephala. 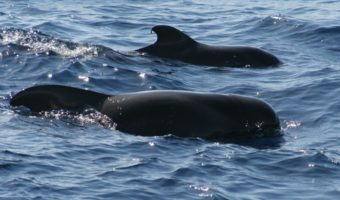 Short-finned pilot whales are part of the oceanic dolphin family (Delphinidae) although their behaviour is closer to that of the larger whales. Short-finned pilot whales can be confused with their relatives the long-finned pilot whales, however, there are various differences. Their flippers are shorter than those of the long-finned pilot whale, with a gentler curve on the edge. They have fewer teeth than long-finned pilot whales, with 14 to 18 on each jaw. Short-finned pilot whales are black or dark grey with a grey or white cape. 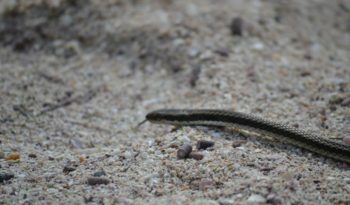 They have grey or almost white patches on their bellies and throats and a grey or white stripe which goes diagonally upwards from behind each eye. Short-finned pilot whales heads are bulbous and this can become more defined in older males. 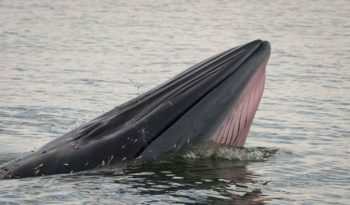 Their dorsal fins vary in shape depending on how old the whale is and whether it is male or female. Short-finned pilot whales have flukes with sharply pointed tips, a distinct notch in the middle and concave edges. They tend to be quite slender when they are young, becoming more stocky as they get older. They have no prominent beak. Adult Short-finned pilot whales measure around 3.5 – 6.5 metres in length. When they are born short-finned pilot whales are about 1.4 – 1.9 metres long. At birth, short-finned pilot whales weigh about 60 kilograms (135 pounds). 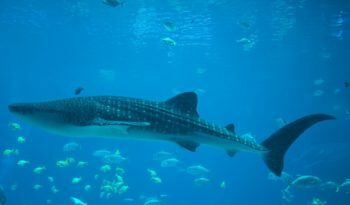 A fully grown adult will weigh between 1 and 4 tonnes. Short-finned pilot whales feed mainly on fish, squid and octopus. Their tail flukes raise out of the water before a deep dive. Sometimes they may float motionless at the surface. 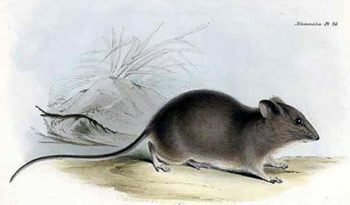 They are frequently seen in very large groups. Pilot whales prefer deep water, they are sociable mammals and may be approached and you can even swim next to them. Short-finned pilot whales are rarely seen alone and are found in groups of 10 – 30, though some pods are as large as 60. They are sometimes seen logging and will allow boats to get quite close. Short-finned pilot whales rarely breach, but may be seen lob tailing (slapping their flukes on the water surface) and spy hopping (poking their heads above the surface). 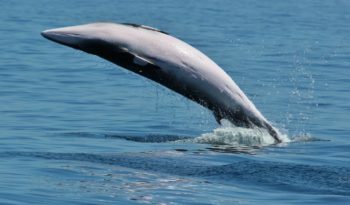 Before diving, they arch their tails and raise them above the surface. 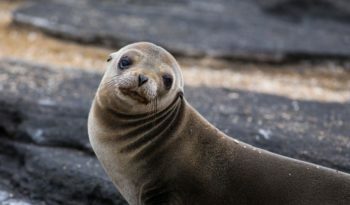 When coming to the surface to breath, adults tend to show only the top of their head, whereas calves will throw their entire head out of the water. Adults occasionally porpoise (lift most of the body out of the water) when swimming particularly quickly. Short-finned pilot whales are often seen in the company of Common and Bottle Nose dolphins. 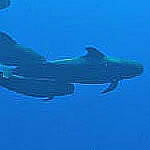 These are the only pilot whales that occur on Galapagos marine reserve. The conservation status of the Short-finned Pilot Whale is ‘CD – Conservation Dependent’.